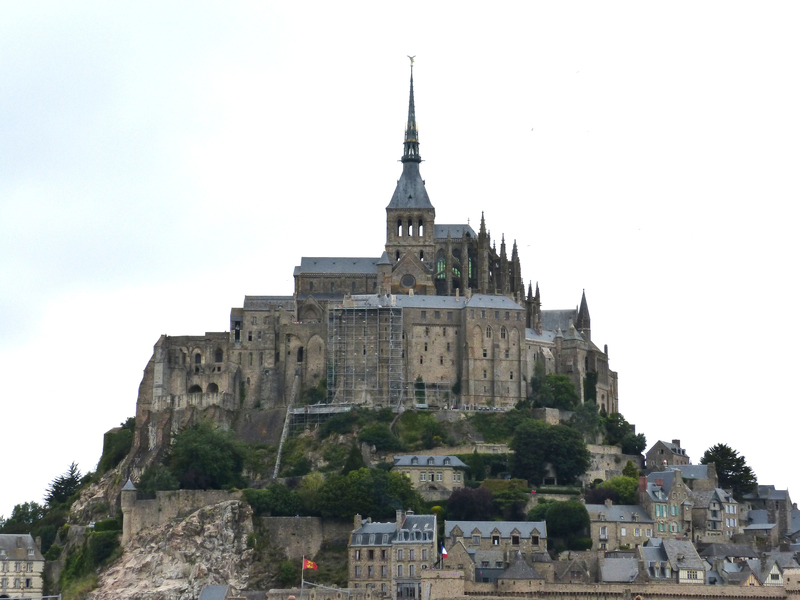 Mont Saint Michel is a small mountain of an island just barely off the coast of France near the line that divides Brittany and Normandy. Although I’ve been there a few times I have never climbed the stairs to the top of the island where there is a thousand-year-old monastery church. I’d really like to see the church, and given all the walking and hill and stair-climbing I’ve been doing on this journey, I think probably I can do it. As you can see in the photo above, it’s really quite a climb! But Ireland, England and Northern France have been experiencing a wind and rain storm for the past couple of days. Accuweather told me it would stop around noon today, about the time I would arrive. But turns out that was Not-Accu-Weather because its now nearly 5:00 pm and its still blowing and raining here on the Breton coast. Here’s a nice view of the very top of the church. The forecast for tomorrow and the rest of the week is much better. Maybe I’ll try again. You may notice a small change in this webpage. I’ve introduced a “cloud” index to that you can find particular posts related to places I’ve written about on this blog. The larger the word, the more posts there are about that place. Somebody asked me about my Paris posts recently. Now, just by clicking Paris in the “cloud” she’ll have access to all of them. I hope you’ll find this useful. 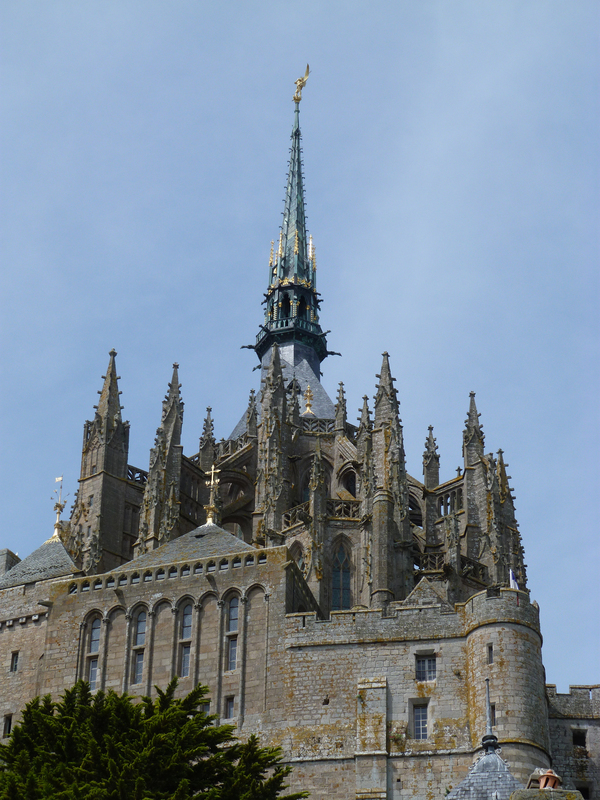 This entry was posted in Brittany, France by Libbie Griffin. Bookmark the permalink. Hope your rain clears up on schedule! I’ll look forward to hearing about your climb and seeing the photos. My funny association to Mont St. Michel is a 1000 piece puzzle with a picture of it that we used to work at my grandmother’s house when I was a child. How funny! Hadn’t thought about that in years, but it always tickled my imagination.